June 9th, 2008: Sunny and Hot, Water Temp 85* and Clear. 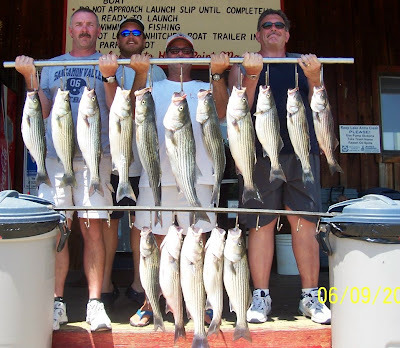 John picked the guys up at 5:30 and found a school of Stripers and put Herring on down lines in their faces which started a day of good fishing for his clients. He hit 3 or 4 schools of fish catching 25 Stripers before running out of 150 Herring then converted over to trolling artificals catching 15 more to make this nice stringer. Striper Al is the guy in the middle holding all the weight of the stringer which compressed his body , that's why you can't see his face.